Salle de bains attenante à une chambre avec douche, wc et lavabo. Salle de bains deux avec grande douche, wc et lavabo. En bas vestiaire avec wc et lavabo. From first dealing with the owner, I knew this was going to be a highly professionally run property. The house is nicely maintained by passionate owners who have great attention to detail. A few glitches with the property certainly indicated how committed Alex and Jason are to making your holiday stay as perfect as possible. Within minutes of reporting slight issues they were proactive and no expense spared to deal with swiftly. After two weeks we loved it and felt Alex, Jason and Wendy had become friends. You must stay when in Barbados, I am already discussing return dates. 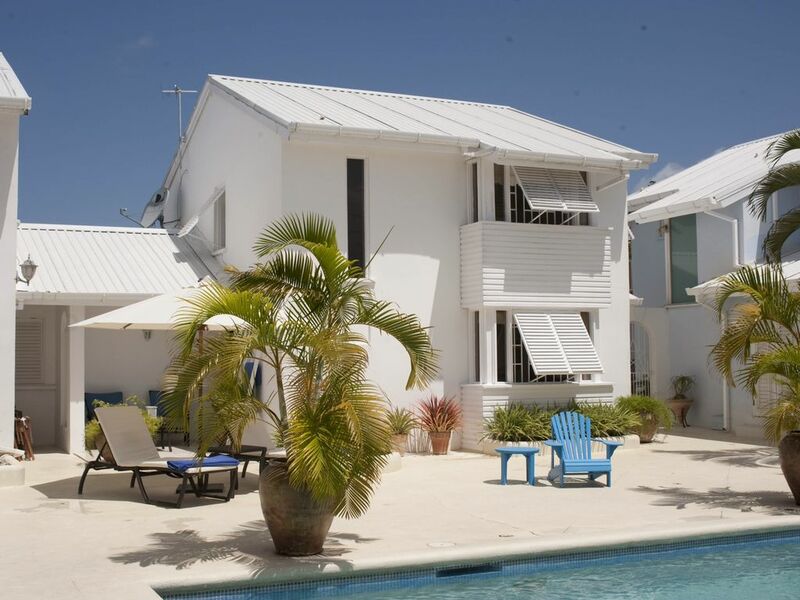 I travel to Barbados often and this property is really good value for money in a great quiet safe area. We loved having Gillian and her friend stay at the house! They were friendly, respectful of our property and genuinely lovely people. They were patient with us when one of our air conditioning units stopped working, reported it straight away, understood that these things sometimes happen and we were pleased we could resolve the problem within 24 hours. They have talked about returning in November - we would have them back in a heartbeat! When we arrived at 2 Mango Court, we were greeted by the owners Alex & Jason. Alex & Jason made us feel extremely welcome & after a long flight it was great to see some necessities placed in the fridge & cupboards such as milk, eggs, tea, bread, beer etc. Alex & Jason showed us around the house & gave us some hints & tips on places to visit & things for us to see & do. The house itself was absolutely beautiful, just like in the photo's, it was a true home from home experience - we couldn't fault it, the house had everything we needed. We didn't once say, damned we wish we had this. The pool was fantastic, my 12 year old daughter couldn't get enough of it.. It was lovely just getting up in the morning, having breakfast around the dinner table & then going out for a swim. The location of 2 mango court was perfect, you can walk to the beach in about 5 minutes, walking to holetown took us about 15 minutes. But what was great is that a bus stop for the reggae reggae bus is about a 2 mins walk from the house & for 2BBD you can go to holetown or speightown. We stayed for 2 weeks & hired a car for 1 of the weeks, whilst the car was handy to have, it wasn't really necessary. If you're looking to snorkel with turtles we'd recommend going with Jason, he also owns a catamaran & we went on the sunset cruise which was fab - we snorkelled with the turtles & snorkelled on the reefs - it was a very personal experience .. .
We had an amazing 2 weeks, fantastic accommodation, location was spot on, superb hospitality from Alex & Jason - We didn't want to leave .. We'd totally recommend staying here to our friends & family & we hope we' get the chance to come back. Thank you for reviewing your recent stay at our house in Barbados. We make every effort to ensure our guests have everything they need and are so pleased when we hear they have had a wonderful time. It was an absolute pleasure having you stay and we hope to see you back on this beautiful island again one day. The whole experience with Doreen and Mike has been exceptional. From the time of booking to when we flew out there was numerous emails including advice on Barbados to asking what we wanted stocked in the fridge when we arrived. I travelled with my wife and 17 month old son and my parents. I was a little worried taking a little one but I needn't have been. Doreen arranged for a cot and lots of toys much to the excitement of my son! We felt instantly at home. The house and pool is lovely and very comfortable. Everything has been finished to a high standard and is just as pretty as it looks in the photos. It has everything you need, including beach bags and beach mats which we were available to use. The location is accessible though I would certainly recommend a car, especially if you have a little one. Even so there is a bus stop a few minutes walk making getting around easy. One of the best points is the beach which is a 5 min walk away which is extremely secluded with some natural ( tree) shade - perfect for us. In addition the Colony club is just a further 5 min walk which did amazing half price cocktails between 4 and 6 pm! We did a lot of sight seeing including the caves and st Nicholas and mount gay rum tours which we would recommend. In addition we did some diving with reefers and wreckers in Speightstown who were amazing. If you get a chance you should definitely go to The Cliff for a cocktail which will not disappoint. There are many good restaurants near by so you will be spoilt for choice. Overall we had a fantastic few weeks in Barbados and would highly recommend Mike and Doreen's beautiful house. Mango Court est à seulement dix minutes à pied de Heron Bay et Alleynes Bay. Les deux sont de belles plages de sable doré où vous pourrez bronzer, faire de la plongée et nager, et avoir accès à des sports nautiques, des bars de plage et des restaurants de première classe. Bridgetown, la capitale du pays et la zone du patrimoine vaut le détour, et se trouve à environ 30 minutes en voiture. D'autres endroits d'intérêt sont l'abbaye de Saint-Nicolas (environ 25 minutes en voiture) et à partir de là, vous pouvez explorer la belle côte est accidentée qui est sur le côté de l'océan Atlantique de l'île. Grantley Adams International Airport est situé à 40 minutes en voiture.